Fruit is an important part of a healthy diet. It provides you with complex carbohydrates, fiber and many vitamins and minerals that can protect you from heart disease and other conditions. If all you eat is fruit, you are missing out on many other essential nutrients, such as protein and fat, and you may also upset your digestive system. If you need help designing a well-balanced diet, see your doctor. By only eating fruit, you will miss out on protein, which is imperative for your development and growth. Your body also needs this nutrient for energy and calories, and in fact, every one of your cells contains some protein. According to MayoClinic.com, 10 to 35 percent of the calories you eat in a day ought to come from protein. A balanced diet should emphasize plant source of this nutrient, such as soy products, lentils, beans and nuts that have not been salted. If you consume animal foods, you can also get protein from fish, skinless poultry, lean meat and low-fat dairy. 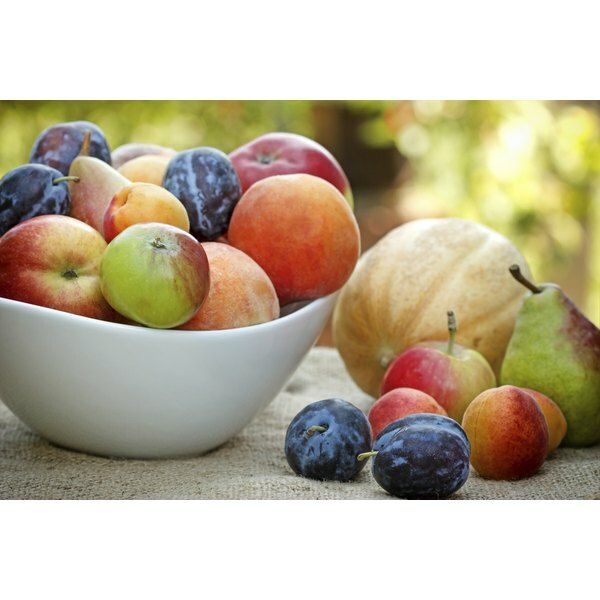 Fat is another nutrient you need and will not get if you eat only fruit. Though you should not consume it in excess and some kinds of fats are bad for you, your body needs this nutrient to keep your immune system functioning, as well as to absorb the vitamins and minerals from other foods you eat, like fruit. Furthermore, being on a very-low fat diet may increase your chances of having a stroke caused by a bran hemorrhage. About 20 to 35 percent of the calories you eat in a day should come from fat, says MayoClinic.com. Focus on getting this from unsaturated sources like olive, canola, sunflower and soybean oils. Poultry and fish are healthy sources of fat as well. Most fruit contains large amounts of fiber, and while this is an essential nutrient, getting too much can have negative side effects. Fiber helps your digestive system work more efficiently, but adding too much too quickly can cause stomach upset and result in symptoms like bloating, cramps and gas. You may also begin to have loose stools, and chronic diarrhea can put you at risk for dehydration and other health problems. Keep your fiber intake around 22 to 28 g a day if you are a women and 38 to 34 g a day if you are a man, and remember that whole grains, seeds and vegetables are a good source of this nutrient as well. Another danger of eating only fruit is that you may not be getting enough calories, as produce tends to be low in calories. Consuming fewer than 1,100 calories a day can cause side effects like hair loss, gallstones, intolerance to cold and fatigue. See a licensed nutritionist if you need help determining how many calories you should eat in a day, and ask about incorporating other foods besides fruit into your diet.